Capital ADVOCATING FOR BUSINESS. FUELLING THE FUTURE. Ottawa Advocacy Day with Mayor Jim Watson, City Councillors Harder, Blais, and Sudds, as well as a robust delegation of partners representing post-secondary education, tourism, business organizations, healthcare, and our civic economic development organization, it became quite clear that we must work collaboratively, and in an unprecedented manner, if we’re to be successful in making Ottawa a global city of the future. There is a lot happening in Ottawa. The LRT system will be opening soon, and plans are being implemented for additional phases to the east, west, south, and north. Exciting projects in South Ottawa include a new Le Germain ALT airport hotel, a revamped gaming experience at the soon to be opened Hard Rock Casino, plans for a new movie and television production soundstage, and an autonomous vehicles test track. The continual reconstruction of the downtown core currently features a revitalized West Block on Parliament Hill and Government Conference Centre on Wellington, not to mention the Elgin Street dig. Additionally, Amazon is changing the vistas in the far East End of Ottawa. Much is happening to contribute to Ottawa’s evolution – and we must ensure we are working together. IN THE PAST YEAR We made history! With the joining of the Ottawa, West Ottawa, and OrlĂŠans Chambers, our city has a stronger, unified voice to speak for the business community. Representing businesses and stakeholders of all sizes and sectors; east to west, and south to downtown, your all-new Ottawa Board of Trade is the Voice for Ottawa Business. and her treatise A Vindication of the Rights of Woman published in 1792, through to the suffragettes in the early 20th century, up to now, there has been a tremendous change for the better when it comes to gender equality. We wanted to use this issue to celebrate some of the amazing women leaders we have right here in Ottawa. This issue features an interesting cross-section of women that have made structural change in both the public and private sectors. From Lise Bourgeois, President and CEO of La Cité Collegiale, to the Right Honourable Beverley McLachlin, the former Chief Justice of Canada, Ottawa has embraced inclusion and diversity in the workplace. 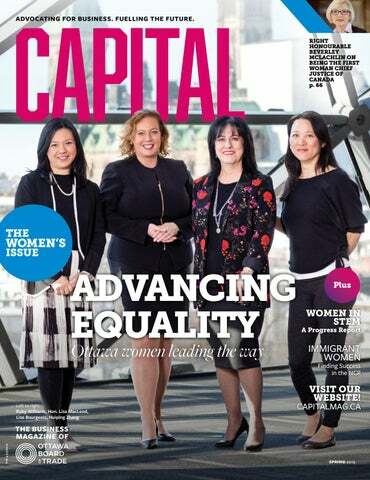 Throughout the process of putting this magazine together, it became apparent that there is no shortage of women working hard and achieving success in the National Capital Region. We barely scratched the surface. But it also became apparent that there is still work to be done. That change cannot be achieved solely through the hard work and resilience of the women trying to make it; it has to come from the companies and institutions hiring them to make equality on all levels of their organization a priority. As a small business owner, I have always employed many women. In fact, I am outnumbered. The women I work with are talented, creative, intelligent, and dynamic, and in three decades in the business, some of the biggest projects I have been involved in have been run by women. I hope that this issue can open a dialogue about gender equality. I owe a great debt of gratitude to the contribution women have had in my business and in the community I am part of. I would like to thank my supporting partners in making the magazine happen. I hope that this issue provides an indication that change is still happening, and that as long as there are women like the trailblazers in this magazine, it can only get better. ISSN 2371-333X. All rights reserved. Any reproduction of the contents without prior written authorization from the publisher is strictly prohibited. PM 43136012. Capital is published three times a year: winter, spring, and fall. Printed in Canada. The magazine about doing business in Ottawa, created by the Ottawa Board of Trade in partnership with gordongroup. embrace risk, and accept their responsibility to make a difference in the world. It is incumbent upon women who have achieved the success mindset to share their stories as a means of inspiring others to do the same. And all women must actively look for ways to grow as valued individuals, use their voice, and find their unique path to contribute to equality and community growth. The Board of Trade hosts events designed for women to share experiences, build relationships, and be inspired by local leaders telling the real story of their success. You will also find within these pages and our network many women who lead by example. women-focused education, funding opportunities, and recognition programs. There cannot be too much done in this area. The key will be to leverage each of these networks to the one key goal of achieving equality. The Board of Trade believes there is power in clear communication and true collaboration. We intend to keep the gender equality conversation going strong and create a community that is well informed of the real issues and synchronized in its approach. We encourage a broad range of thought leadership and request decision makers in all sectors and at all levels of government to add the lens of gender equality to every portfolio. We are proud to work closely with like-minded organizations and businesses on this issue. Our future prosperity relies on it. are excited to add this lens to our policy positions and will be working with volunteers, community partners, and government to reach our collective goal of gender equality. Men as Advocates It must be said: gender equality is not a women’s issue. It is a community growth issue. It is not “women instead of men.” It is “women and men, as equals.” Men have an integral role in the fight for equality and just as much to gain. We are very fortunate to have many men within our community who have declared their support for equality, demonstrate it daily, and take meaningful action toward our goal. All Board of Trade initiatives on equality are inclusive of men. In fact, it is our winning strategy. Finally, this edition is focused on gender equality from the first world perspective. The issue is completely different in underdeveloped countries and we are grateful to organizations with this important focus. It is our intention that the aggressive pursuit of equality in our community will have far reaching impact on global equality. Thank you to our members, local businesses, and community partners for continued dedication to Ottawa’s growth and prosperity. We hope you find this edition of Capital informative and inspirational. We are honoured to serve you. Sueling Ching is an advocate, consultant, and community leader. Nous formons des professionnels dignes de confiance, bilingues et prêts à performer. We train thrustworthy bilingual professionals ready to perform. Plus de 140 formations adaptées au marché du travail. More than 140 programs adapted to the employment market. “When I started, I thought I would only be here for a couple of years,” she goes on. “I thought I would get back out in the workforce then move on. But I really found that I liked the work environment here, and there were so many opportunities to learn about an industry in which I had no previous experience. It’s a very family-oriented company; it allowed me to be able to balance my work life and family life. If I had to leave the office to take care of a sick child—that was never an issue.” In addition to leasing, Merkburn offers property management for third-party owned buildings. In celebration of half a century, they are breaking ground on a new building in Kanata this year—the first time in years they will be constructing a new building. This move is going back to their roots as a construction company. Merkburn Holdings was founded by William S. Burnside and the late Cameron Merkley who were joined shortly after by Frank Dooher. Together they led Merkburn into their future of leasing and property management. Now they are leading the way in commercial real estate, providing expert guidance to potential tenants to find the best fit for their business. WHERE BEST PRACTICES MAKE PERFECT When you’re known for developing innovative, industry-leading human capital management solutions, it clearly makes sense to apply those same solutions to your own place of business. every customer—is valued, respected, and supported. Its mandate is simple but enormously effective—ensure that every employee feels that they can bring their ‘whole self’ to work each and every day. Turner says Ceridian leadership constantly asks: how can we continue to improve the lives of ALL our people, taking a holistic view while also addressing specific issues? “We’re always seeking ways to have our people better contribute, participate, or be heard, be it through sharing ideas or raising concerns. And that improves our ability to serve our customers,” Turner says. Last year, Ceridian decided to go one step further, earning a thumbs-up from EDGE (Economic Dividends for Gender Equality), the leading assessment methodology and business certification standard for gender equality. After a comprehensive audit certification measuring its gender balance, pay equality, policy effectiveness, and the inclusiveness of the culture, Ceridian became EDGE-certified in 2018. And convinced that more can always be done, Ceridian will continue to work with EDGE in 2019. T H AN K YOU TO T HE S HAW CENTRE FOR A LLOWING US TO USE THEIR S PAC E FOR OUR PHOTO S HOOT. Minister of Children, Community, and Social Services and the Minister Responsible for Women’s Issues, says a lot has changed in terms of gender issues over the past 14 years since she first ran for political office. “Back in 2005,” she says, “I had just given birth to my daughter, and I had a number of people tell me I couldn’t do it because I was a mother. That was the criticism that people would send my way. It was a signal about how out of touch some people could be.” After having won a seat in a 2006 provincial by-election as a new, 31-year old mother, she recalls bringing her daughter Victoria to Queen’s Park only to face an “un-family friendly legislature” that would sit from one o’clock in the afternoon until nine o’clock in the evening most days, sometimes until midnight. “Those of us with small children weren’t able to put them to bed. I advocated for making Queen’s Park family friendly. Now we sit between nine and six during the day. We have a high chair in the dining room, and there are change tables in the bathrooms,” she says. MacLeod is also proud that she has been able to recruit more women who are, like she was starting out, moms with young children. Lise Bourgeois has been president and chief executive officer of La Cité, the largest French-language college of applied arts and technology in Ontario, since 2010. But in the late 1990s, when she decided to move from the classroom into management, there were only a handful of women in executive leadership positions in education. “I looked at them as confident, determined, and inspiring women who had all this resilience. I looked up to them knowing that if they could do that, I could also,” she says. One of the key aspects of her leadership style is that she is never willing to accept the status quo, and seeks to innovate. She recalls the influence of her mother, Rita, who taught her the importance of being a strong and visionary person, but also a fair and committed leader determined to always improve and strive to move forward. For Komal Minhas, a member of the millennial generation, the biggest challenge in her young career has been personal. Minhas, who was born and raised in Grande Prairie, Alberta, moved to Ottawa in 2007 to attend Carleton University, and then lived in New York City after graduating with her degree in journalism, political science, and human rights. In 2016 she produced and funded the feature documentary film Dream, Girl, through her consulting company KoMedia, about female entrepreneurs in and around New York. That film premiered at the White House under President Barack Obama. During the film’s launch, Minhas, at only 26, was diagnosed with a rare form of cancer. She was deemed cancer free a few months later, following treatment. However, in early 2017, as the film continued its global tour, she was diagnosed with a neurological illness that forced her to move back to Canada. “During that recovery when I was in a medically needed isolation, I realized there wasn’t a community online that reflected my experience as a woman of colour, as someone who was highly ambitious, who wanted to feel a sense of community, even though I couldn’t physically be in spaces because I was limited by my illness,” she says. Minhas recently launched kaur.space, a digital magazine and online community focused on work, wellness, and impact, or legacy. That brand will expand into a physical community work space in Westboro later in 2019. Co-work spaces provide a network upon which entrepreneurs, including a growing number of female entrepreneurs in Ottawa, can access critical resources like funding and legal services. Ruby Williams has seen significant improvement in professional acceptance of gender equality in the workforce and leadership opportunities for women. “When I first started, I was probably one of the few women in my field. Most, if not all, of my clients were male,” says Williams, a chartered professional accountant and senior manager with Deloitte LLP. “Over time things have changed. We have more women interested in the field. We have enhanced our hiring policies. We focus on diversity. I think that brings in more perspectives and allows us to service our clients better.” Williams, who was born in Edmonton but grew up in Hong Kong, arrived in Ottawa in 1996 to attend Carleton University. She is now firmly ensconced as a member of the community. Williams sits on the Ottawa Board of Trade as its treasurer, and is also co-chair of the Board’s Capital Build Task Force. of an interest-free loan. The investors retain no equity from the company, and the recipient pays the money back, where it will get reinvested in another company by vote again. As the money is paid back, they are able to invest in more companies each year. SheEO started in Canada four years ago, and has to date funded 55 companies with a hundred per cent payback rate on the loans received. “SheEO has looked at the systemic barriers that are stopping women from getting capital and we’ve built a whole new model,” Saunders explains. The companies they have invested in have doubled year to year on average. One of the companies they have invested in, Abeego, creates breathable beeswax food wraps that keep food fresher for longer. Another, Alinker, is a walking bike that addresses the fact that 50 per cent of people in wheelchairs can still move their legs. The bike allows for lowimpact exercise, while staying at eye-level to peers, an important part of social inclusion and improved self-image. “Every company we fund is creating things that make the world a better place,” Saunders says. And with access to this network of radically generous women, they will go far. Like MacLeod, Williams has had to balance a career rise with being the mother of young children (Ben 8, and Matt, 5), for whom she prioritizes quality time whenever possible. She credits her family with providing critical support. “I wouldn’t have advanced this far in my career without the support from my husband, Doug, and my extended family, especially my mother, Connie. I’m lucky that everybody’s willing to chip in when needed,” says Williams. MacLeod also credits her family for making her career rise possible, and the importance of having time to enjoy family. “I couldn’t be doing this without my husband, Joe Varner. His flexibility, his support, his unwavering love and devotion to me and my daughter, has allowed me to have a strong foundation from which to serve,” she says. In advising young women who aspire to leadership roles, Bourgeois says, “my first piece of advice would be to have a dream of where you see yourself and what you want to accomplish. Second, visualize and take the steps to make it happen. Believe in your potential. Do not take no for an answer. Have a mentor and role models that you can relate to as guides.” Having a professional mentor was another common theme behind all of the successful women profiled. MacLeod credits city counselor Jan Harder (Ward 3 – Barrhaven), who MacLeod once worked for shortly after arriving in Ottawa from Nova Scotia in 1998, as a mentor. She also notes how the late Jean Piggott, a former member of federal Parliament, as well as Piggott’s sisters Grete Hale and Gay Cook “always provided me with their support.” Williams notes there are “many great people at Deloitte who have helped mentor me at critical parts in my career. Susan Mingie, a senior partner, leads by example with her hard work and passion, and has shown me how to achieve a successful career. David Boddy, the partner who hired me into mergers and acquisitions, is never short of wisdom. And Bruce Beggs, whom I have worked with for many years, offers kind words that have always motivated me to do better every day.” “Since I’ve come back to Ottawa, I’ve noticed there are a lot more networking groups of women who come together to discuss entrepreneurship, to discuss business, and discuss the future of the city,” says Minhas. Minhas cites the support of two local men who have been mentors in her career, emphasizing the importance of having both men and women championing the advancement of women in business: Adam Miron, the co-founder of Hexo Corp., a billion-dollar recreational cannabis company, and Paul Dewar, former member of federal Parliament who recently passed away. “When I think of Paul, it’s in that light of how he tended to see the potential in others. He encouraged that, especially in young people. I want to do the same for other young people in our community to help them really see what they’re capable of doing in the world,” she stresses. Businesses in the NCR can also play a role in empowering local women to seek leadership positions, says Williams. “Tone from the top is important and leaders need to walk the talk. Businesses need to foster an open culture that encourages flexibility in the workplace—that could be in a form of less conventional working hours, schedules, telecommuting, etc.,” she elaborates. “Deloitte offers exactly that to allow me to advance my career— knowing that I can continue to have interesting and challenging work with the flexibility when I need it,” Williams adds. MacLeod attests to the concerted effort by all in society to ensure that gender diversity remains front and centre. “We need a coordinated effort by government, businesses, and social organizations across the province to support initiatives that…promote women’s economic empowerment. We need leadership from all sectors to encourage women to achieve their full potential,” she stresses. The encouraging stories of MacLeod, Bourgeois, Minhas, and Williams are a testament to the leadership mantle that women throughout the NCR, in all facets of the workforce, have seized. And there are many more encouraging stories, like that of Huiping Zhang, owner and president of Wintranslation, an award-winning local translation company. Like many in the NCR, Zhang is an immigrant, and she offers a compelling story on how she grew her business to become a successful entrepreneur. That story will appear later in this issue. Jeff Buckstein is a Kanata-based freelance business writer. (women, visible minorities, members of the LGBTQ community, person with disabilities). Each sub-committee is headed by an executive sponsor. In keeping with Hydro Ottawa’s decision to take a somewhat diverse approach to diversity, the women’s sub-committee is headed by a man. “That’s not an accident,” says Parent-Garvey. “He has a great deal of experience in promoting and hiring women. It was the right fit and it’s worked out exceptionally well.” In 2021, when it comes time for Hydro Ottawa to adopt its third diversity and inclusion plan—and Parent-Garvey is confident that the company will continue its efforts to build a diverse and inclusive culture and workplace—Hydro Ottawa may decide it’s time to set some specific goals. But they’ll do it knowing that many of its goals have already been achieved. “In terms of women alone, we’ve accomplished a great deal,” says Parent-Garvey. “Half of our board members are women, 38 per cent of our executive management team are women, and 36 per cent of our managers are women.” Clearly, Hydro Ottawa’s diverse (and inclusive) approach to diversity and inclusion is working. They also host First Impressions workshops and community-based workshops throughout the year to help women achieve economic independence. Dressing for the job you want is not always an option. That’s why Dress for Success, a registered charity with a local chapter in the National Capital Region, exists. Dress for Success helps economically disadvantaged but employment-ready women by providing them with proper interview attire, and once they land a job, a wardrobe for the first few weeks to make a great first impression. Since the Ottawa chapter opened in 2011, they have supported thousands of women in the area on their new career path. In addition to the clothing, Dress for Success also offers support and assistance to women with career coaching that helps them gain the confidence to nail job interviews and get the job. Participants in the Les Scientifines program had a blast learning about the science and math behind fashion from the Giant Tiger Buying team! Giant Tiger has donated $100,000 to the Canadian Women’s Foundation to help facilitate the Girl’s Fund to help girls challenge stereotypes and build confidence, and they have contributed $1.2 million to the Cure Foundation by selling merchandise with inspiring messages that allow customers to make a difference with each purchase. They also have a program called Giant Tiger Giant Steps, which partners with the Boys and Girls Clubs of Canada. At Giant Tiger, giving back and creating stronger Canadian communities is a part of the company’s DNA. To coincide with International Women’s Day, this year they held an event at their Montreal Buying Office, inviting a group of girls from one of the clubs that receives their funding through their partnership with the Canadian Women’s Foundation to learn about the math and science that works behind the scenes in the fashion industry. The girls were challenged to make purchasing decisions that would be profitable, and learned about not only STEM but also business leadership. unsure of themselves—their value, their contribution, their worth—especially in a male dominated industry,” she explains. “My advice is to find something that you’re passionate about, know your stuff, own your opinions, and be true to whatever your style of leadership or communication is. Be true to yourself and try to make that work for you, and find people that can help you.” “And sometimes,” she reflects, “it comes to not caring that you’re the only woman in the room.” Knox agrees, saying “I think it’s very important for women to build strong analytical and communication skills. Especially if you’re in the business field, it’s important to understand finance and accounting. Be curious and be committed to learning and growth.” Finally, Steele’s advice is simple. “It is okay for women to be humble,” she says, “but never be afraid to let your best moments shine.” Giant Tiger is committed to championing growth opportunities for women at work, and creating better communities in which women can flourish. With so much focus on big players in e-commerce, Giant Tiger is well positioned within the Ottawa, and Canadian, business communities as a retailer that stays true to their values. When it comes down to it, Giant Tiger helps Canadian families by helping them save money and meet their families’ budget. Distribution centre employees increased by Julia Knox at a presentation with the Boys and Girls Clubs of Canada. science and software engineering are also on the upswing, with each registering close to a 125 per cent increase since 2013. However, engineering physics, at 21.6 per cent female enrolment in 2017, electrical engineering at 15.3 per cent enrolment, and mechanical engineering, at 14.2 per cent enrolment, do not do well in that regard, according to statistics. Women represent 8.2% of electronic services technicians for household and business equipment. Women make up 30.1% of computer and information systems managers. At Carleton University, in the fall of 2018, the aggregate figures for both graduate and undergraduate STEM programs showed 30.89 per cent female enrolment, compared to 29.08 per cent in 2013 and 27.37 per cent in 2008. There was, however, significant improvement in engineering, as applications in that subject increased by eight per cent in 2018 over 2017, and the longer-term results are even better. “Since 2015, female enrolment across all engineering and design programs— including both graduate and undergraduate—has increased by 26.5 per cent,” says Adam Landry, a communications officer in Carleton’s faculty of engineering and design. Amine Mire, an assistant professor of sociology at Carleton, says she has observed increasing numbers of women in STEM classes. Many of those students tend to be first-generation immigrants from families where educational achievement in the sciences is heavily promoted, such as from Iran, Syria, or Eastern Europe, among other countries, she notes. There are concerted efforts across the city to enrol a higher percentage of women in the STEM areas. Algonquin College has launched a threeyear pilot project called We Saved You A Seat that reserves up to 30 per cent of classroom seats for qualified female students in science, engineering, technology, and mathematics programs. enter these fields. Diversity and inclusion are proven multipliers to performance and economic growth, and critical success factors for global companies and organizations. This is something we must work on collectively as a society,” says Sonya Shorey, Vice-President of Marketing and Communications with Invest Ottawa and Bayview Yards. “It is essential to inspire and excite young girls about STEM opportunities. This must begin in elementary school (K-12) and carry through high school and post-secondary education,” she elaborates. Shorey believes the increasing engagement of women in STEM programs and careers is attributable, in part, to the international spotlight on this opportunity, and collective, concrete action from many educational institutions, companies, governments, innovation hubs, mission-driven organizations, and communities. This includes a critical mass of well-branded organizations around the world that are investing in diversity and inclusion, and making it a priority. “When leaders champion this action, and put real investment behind it, change is accelerated,” she says. Shorey has also served as a mentor over the past five years with the Mindtrust Leadership Development Program (MLDP) which serves the University of Ottawa, Carleton University, and Algonquin College. MLDP was created in 2004 as a joint venture between Mindtrust, uOttawa’s Telfer School of Management, and Carleton’s Sprott School of Business, in an effort to promote leadership excellence. Students from the University of Ottawa, Carleton University, and Algonquin College directly engage leaders of both genders in a host of professional fields, including business, science, and technology. This year 68 per cent of the university and college students that are participating in Mindtrust are women, says Shorey. As these various academic initiatives come to fruition here in the NCR, as elsewhere, experts are optimistic that the gender gap in the STEM subjects will close, and the excellent leadership provided by women in so many fields in the business, not-for-profit, and public sectors will be expanded even further. DIVERSIFY YOUR WORKPLACE! The Employment Accessibility Resource Network (EARN) can provide you with the knowledge, resources, and support you need to access great talent and increase employment opportunities for people with disabilities. We can: • Advertise your job posting to our employment service provider network • Pre-screen candidates and connect you with our partners’ top tier applicants • Organize tailored recruitment events • And much more. Let EARN help you access an untapped talent pool. Jean E. Pigott (right), with Jeanne Sauvé, then Governor General of Canada on the Rideau Canal Skateway. and her title is Chairman. The text is from 1987-88 when Jean Pigott held the top job at the National Capital Commission (NCC). Eventually the title would adjust, not just at the NCC, but across the majority of organizations as women made their mark. A mother, a successful businesswoman, an important pillar in her community, and a Member of Parliament for Ottawa-Carleton, Jean Pigott was an example for women, and men, in leadership positions. During her tenure (1985-1992), the NCC took over control of the Official Residences and created Confederation Boulevard (the ceremonial route which loops around the two provinces linking landmarks like Parliament Hill, the Supreme Court, the national museums, and other landmarks.) Jean Pigott’s legacy cemented a home for female leadership in Canada’s Capital and at the NCC. By 2007, Micheline Dubé was interim CEO for most of the year before the appointment of Marie Lemay who held the position through to October 2012. Today, women in leadership positions span across the NCC. They are behind important decisions that shape Canada’s Capital Region. These women are executive directors or directors leading the NCC’s stewardship of parks, lands and real estate, human resources, public and corporate affairs, planning, Gatineau Park, finance, audit, legal services, environmental, and wildlife conservation. None hold a title that implies they are a man. Women leaders, like Jean Pigott, changed that. number when it comes to inclusion. It’s the tipping point from tokenism to creating real change. “We didn’t pull that number out of the air,” says Sarah Gauen, Inclusion and Diversity Specialist at Algonquin College. “30 per cent is the number that’s been proven—when you look at boardrooms, when you look at team interactions—if you have 30 per cent representation for one group, that’s the number when you start to get meaningful interactions and when the contributions of women in particular start to make a difference.” This number has been picked up by the Ontario Securities Commission as a requirement at the board level for representation for women, and Algonquin is using it as a goal post for enrollment in their tech programs. They came up with the We Saved You a Seat program as a way to combat gender imbalance in enrollment. The program reserves 30 per cent of classroom seats for qualified women in four STEM programs: Computer Systems Technician, Electrical Engineering Technician, ElectroMechanical Engineering Technician, and Mechanical Engineering Technology. hired by a company where they had a connection. Networking with purpose can be more of a challenge. Research suggests that women statistically attend shorter networking sessions, such as breakfasts or local events, whereas men network using longer events, such as conferences, games of golf, or other sporting events. This can mean less face time with valuable connections, whereas a longer session can result in more meaningful conversation past the initial small-talk. It’s important to create those opportunities for yourself, and build a targeted network of people who will help you along the way. Erin Crowe, CFO of Martello Technologies Group Inc.
resume is a testament to the growing achievements of women in senior management positions in various sectors, industries, and companies in the National Capital Region. Crowe, a chartered professional accountant, has had an interesting career path that includes 18 years with the Ottawa Senators between 1996 and 2014, ten of which were as Chief Financial Officer (CFO) and Executive Vice President of the NHL team. During her tenure the team went through a Companies’ Creditors Arrangement Act (CCAA) restructuring and change of ownership. “When people ask me what was the biggest accomplishment of my career, I still think back to the Senators’ CCAA filing and the change in ownership and the sale of the team, and how I played a big role in that transition,” recalls Crowe. After leaving the Senators in 2014, Crowe subsequently spent about 18 months as CFO and Chief Operating Officer (COO) of the Regional Group of Companies, a large local real estate firm, and then just over a year as CFO of ProSlide Technologies Inc., a global waterpark design and manufacturing company. situation has improved over the past five to ten years, with a lot more attention being paid to the gender gap. “Organizations are starting to realize that gender diversity, along with other types of diversity, are not things that are just ‘nice to have’ for business. They’re really imperative,” she stresses. One advantage the Ottawa business community offers for leaders of both genders, says Crowe, is that the city is relatively small compared to other international venues, and is therefore very well connected, so individuals can be recognized quickly for their accomplishments. works within our group of companies today. I have great respect for her vision, business acumen, and her values and beliefs. Alongside the incredible potential I saw with the business, Maureen was one of the reasons why I was so attracted to come to Cowan in 2010,” says McLachlin. McLachlin began her career with The Co-operators in the late 1980s. “I have fond memories because they were the type of organization that invested in us, and encouraged us to aspire to different and non-traditional roles. I had a variety of executive level, corporate, and field roles across The Co-operators Group of Companies,” she recalls. All of that provided excellent training for when McLachlin joined Cowan Insurance Group’s head office in Cambridge, Ont. as the company’s President in 2010. “I love it,” she says of her current position. The NCR is considered a prime location for Cowan Insurance for many reasons. “Ottawa is vibrant and growing, and there are so many exciting opportunities, so as a business we’re incredibly proud to be here,” says McLachlin. “I think there’s a wonderful climate in Ottawa that combines collaboration between academia and government and business. That tripod of relationships working effectively is a unique recipe that Ottawa has been able to foster that also attracts businesses to want to come to this city,” she says. Cowan Insurance Group has a very diverse, expanding business in Ottawa with lots of upside opportunity in a city that continues to expand and innovate. “Our association with the Board of Trade has also been really important in the sustainability of that business,” McLachlin explains. NAV CANADA prides itself—with considerable justification— on its commitment to innovation, collaboration, and excellence. NAV CANADA employees not only share that commitment— and their diversity, talent, and relentless pursuit of excellence— they secure NAV CANADA’s position as one of the world’s most respected Air Navigation Service Providers. we are, we have the freedom to set our own path, to work as a team but to contribute in our own way.” In 2000, Amanda Devine, now a manager in Aeronautical Information Management, graduated at the top of her class from Moncton Flight College. One of seven women in a class of 32, she applied to become a pilot at a small charter company in Prince Edward Island. “I was told ‘we don’t normally hire women so if you want to fly for us, you’ll have to prove you can do the job.’ Wow, I thought, so this is the real world,” she says. Six months later, after watching pilots with less accolades (who just happened to be male) get most of the flying time, she quit. Five years later, and no longer pursuing a career as a pilot, Devine joined NAV CANADA. Five years after that, she approached a national manager for a challenging role in another area of the company. “I certainly wanted the job, but I was afraid personal obligations would prevent me from carrying out many of the tasks the job required,” she recalls. This time, there are no hoops to jump through, no being overlooked because she is a woman. “I was told ‘we’ll work something out. Take the job and we will make this work,’” she says. “Months later, a senior male manager said he felt I had leadership potential and that he would like to mentor me. For the first time, I realized that I had been limiting myself as a woman, that I had been backing away from opportunities.” Today, Devine is a leader and mentor as well as a mentee. She participates, shares her ideas, offers suggestions. She appreciates and feels appreciated. “And I don’t have to go through any extra hoops to do it.” Clearly, NAV CANADA is on board. In an industry once regarded as male-oriented, it has opened the door for talented women— like Lyne, Jennifer, Ginette, and Amanda—to assume meaningful roles in helping to keep Canada’s skies safe. Brittany Williston, Rehabilitation Consultant, PPRC Inc.
letter online if you’re looking for a job. Online application systems often screen out applicants who are ready and willing to work, according to Brittany Williston from Performance Plus Rehabilitative Care (PPRC). “Every day clients come to us and say ‘I want structure, I want a sense of purpose. I want to feel like I’m contributing. I have these skills, let me use them,’” says Williston. “People with disabilities are an untapped market—they have the skills to contribute just as well as anyone else.” PPRC is a private company that provides employment support to help people with disabilities get meaningful work. “We find our clients need to network through our employer liaisons and job developers,” says Williston. “This helps them to build the connections they need to get the job.” She helps clients develop the skills needed to find employment by establishing goals, preparing a resume, and learning interview techniques. It’s a collaborative process to identify a client’s skills and overall aspirations, and ensure the necessary supports and accommodations are in place for their integration into the workforce. Much of PPRC’s approach is modeled from the experiences of the team, under founder Linda Simpson. investment leaving the country,” she continues. “I think the government is in a position now to really think about what it is going to do to ensure Canada’s competitiveness, and that means getting us market access and introducing effective and efficient climate change policy. We are competing with jurisdictions that don’t follow the same environmental standards as we do, that don’t follow the same labour and human rights standards as we do. Canada deserves to compete, and right now I think Canadians aren’t sure if that’s the case. I want to make a case for that here in Ottawa.” Joseph’s long-term goals in Ottawa include building up a team and starting an internship program that will allow young people to gain exposure to the industry. The association is in the process of setting up new offices in Ottawa this year, and Joseph hopes this space will offer the opportunity for other associations to come together to collaborate. and development that allows people to thrive. For a number of years she worked on Northern and remote community issues, including with the Nunavut Association of Municipalities, where she developed an appreciation for the resource industries that create opportunities in those communities. “I love the idea of ‘how do we do better,’” she says. As a woman of colour in the male-dominated oil and natural gas industry, Joseph says she feels blessed to be in a time where being female has never felt like a barrier. A civil-engineer by trade, her experience was engineering programs seeking out women for enrollment, schools focused on equipping young women to be leaders, and supportive male and female peers. Her advice to women trying to make it in industry? Take advantage of all the great opportunities that exist for you—take risks, work hard, and do your best. Canada needs you and your talents, and we are lucky to live in a country with so many open doors. “Although Parliament was where the politics of Canada happened, the Rideau Club was where the relationships of Canada were built.” That line, from Savoir Faire, Savoir Vivre: Rideau Club 1865-2015 by Christopher McCreery, still perfectly embodies what the club is about today, says Carol-Ann Goering. Goering, the General Manager and Chief Operating Officer of the Rideau Club, describes it as a welcoming place. “Our members are a diverse group, so there are some lively discussions,” she laughs. “But at the end of the evening, members give each other a hug and a hardy handshake when they leave, and they’re back the next week for another thought provoking conversation.” Although the social club is celebrating its 155th birthday next year, they are changing with the times. As the first COO of the Rideau Club, Goering is one of only a few women at the top of members-only clubs, which have traditionally favored male leadership. It’s part of a shift that Goering herself is leading as the first female President of the Canadian Society of Club Managers, and she is thrilled to have been recently appointed to lead the change in support of the Board’s long-term goals for the club. “One of the ways we are growing our membership is by encouraging diversity,” she explains. “We want to be more reflective of the faces of Ottawa.” Last year they had a record number of new members, a 300 per cent increase over their average, in part due to efforts to not only include more participation from minority groups and women, but also opening themselves up to new industries. Formerly known as predominantly government, the club now has a significant number of members who are leaders in the arts, technology, nonprofit, law, finance, and many other industries. The goal of the club is to be representative of the unique ecosystem of the Nation’s Capital. experience,” says Goering. “Our vision, and what gets us up in the morning, is the opportunity to create a memorable experience for our members and their guests.” The club is welcoming a female President in the coming year, and with Goering as COO, it will be two women leading the charge. Their leadership team is about 70 per cent female already, and they are proud of the strong women in those roles. “For me, clubs are the perfect profession for women,” Goering says. “Clubs are all about relationship building, it’s about understanding member needs, and it’s about sharing the special moments in a member’s life.” Indeed, they have one employee who has worked there for over 56 years, and, as a club ambassador, still attends member events. She recognizes members from when they attended the annual Christmas parties as kids with their parents, and is now there to welcome them to club events with their own children. “We have many employees at the club that have been there for 15 or 20 years,” Goering says. “They’ve known the members for years, through good times and bad—through the birth of their children, or the death of their spouse. What a feeling it is to come to the club and be known; to be taken care of by people who care about you and your experience. It’s a special place.” That feeling of belonging is a large part of the appeal. The club offers a real sense of community. “It’s the idea of that third place,” says Goering. “You have your home, and your workplace, and then you have the club.” And, she added, with everything happening right now, including planning for major renovations, focusing on technology, and experiencing unprecedented growth, it’s an exciting time to be part of the Rideau Club. Private Cheryl Pagurek has always been interested in the ways we experience the world around us, and the line that is drawn between public and private life. An Ottawa artist specializing in visual art, her work over the years has explored that dichotomy, including a series called Open House for which she built installations of domestic rooms and installed them in public sites. “I was hoping people would share in my explorations of how we intersect has been present throughout my career,” says interact with the world, and one of the things with the ways we are Pagurek. “The way that I work changed as I had children. communicating right now is that they are not transparent—techI had this idea that the baby would stay in the play pen nology frames everything we do,” she explains. “For example, if you as I worked, and that’s not what happened at all. What I realized are a Twitter user, your statements are limited to a certain numwhen I moved back to Ottawa was that I would need a studio space ber of characters, or if you’re on Facebook, you have a certain numin my home, because I needed to be able to work with whatever time ber of emotions to choose to react to something… If you’re reading was available, whether that was in the middle of the night or in the news online or on TV, it’s framed by the presentation. One of the middle of the day.” things I’m more aware of now—and I hope other people are becomOttawa has been good to Pagurek, she says, as she has received ing more aware of—is the way we use technology frames the way we a number of grants over the years for her work. “When my kids were view the world around us. With this installation, it’s your own body young, I used a lot of my grant money for childcare and babysitting that frames the way you interact, and that’s a more active experience so that I had time to work, so that was really key to me being able to while usually we are more passive users of technology.” practice,” she explains. As an Ottawa artist, Pagurek says the community here is very With beginnings in sculpture, it was photographing her Open supportive, and opportunities for women are abundant. “In terms House concepts that set her on the path of photo and video instalof public art, there have been more and more female artists that lations. Her Connect exhibit, appearing at have won those commissions, so you see the Ottawa Art Gallery this spring, explores a lot more public art that’s being done by how technology frames our interaction with women,” she says. “There are many peothe world around us. The imagery in the ple who don’t necessarily go into galleries, installation comes from news footage about so the way they experience art is in the pubreal world events, so you experience these lic realm.” images through the lens of your own body When asked about how being a woman as you move inside the installation, viewing and a mother has influenced her art, she the images through your own shadow. The says: “It’s hard to know what affects what sound in the installation increases in volume in one’s life—does the art affect my life, or April 12 – August 11, 2019 at the closer you are to the screen, creating does my life affect my art? I think it’s a flow the Ottawa Art Gallery a sense of urgency, and each experience is back and forth.” unique depending on if you enter the instalwww.cherylpagurek.com Henny Buffinga is a writer and communications professional lation alone or in a group, as well as how you from St. John’s, Newfoundland. choose to interact with it. Parton or Debbie Harry, Girls+ Rock Ottawa is the perfect place for girls+ to get started, build the skills, and gain confidence to perform. The organization provides a community for girls+ to experience music in a positive and inclusive way, to make them feel represented and recognized, as well as safe and welcome. The flagship event is a three day weekend camp, which gives girls+ the opportunity to learn an instrument, join a band, and perform live. organization prides itself on fostering collaboration over competition, and creating an encouraging, empowering space for participants to improve their skills together. They have also added a camp for women 19+ to hone their musical skills. In addition to the camps, Girls+ Rock Ottawa hosts monthly jam sessions that are on a pay what you can basis to make sure participants aren’t excluded based on income. These sessions offer access to studio space and instruments to practice with a band or jam with new friends. We Saved You a Seat We reserved up to 30% of classroom seats for qualified women in select technology programs. Learn more about how to receive program support, including mentoring and financial incentives. The evidence is overwhelming—corporations with women on their boards do a better job than those with no women members. Studies show that women board members almost always deliver higher returns, tend to be more aggressive, and are loathe to settle for lacklustre performance. They provide diverse viewpoints, bring skills and experience, encourage innovation, and promote excellence. Rosati’s organization—Women Get On Board—is working hard to change that. A member-based company, Women Get On Board connects, promotes, and empowers women to corporate boards. It approaches the challenge from both sides, identifying and empowering women candidates, then working with corporations to ensure the result is a good fit for both the company and the woman board member. One might ask why women make up only 16.4 per cent of board members for Canada’s largest corporations? And why do nearly a third of Canada’s large corporations still have no women members on their boards? “Really, it’s about setting both the company and the selected board member up for long-term success,” says Rosati. And success is possible. For example, 32 per cent of the Ottawa Board of Trade’s board of directors are women. GETTING ON A BOARD Experts agree, to get on a corporate board, women must be more than simply qualified. They must also be known. CEOs and nominating chairs routinely consult people they know and trust to fill a board seat. So if you’re not well known, you’re unlikely to be considered for selection. Still, Deborah Rosati, the CEO of Women Get On Board Inc., and others point out there are a number of things a woman can do to advance her candidacy. Here are five main ones: 1 E  XPAND YOUR NETWORK Your network should allow you to meet CEOs and senior executives. Expand your network by asking them to introduce you to other senior executives, board members, and professional recruiters. 2 CONSIDER A BOARD TRAINING PROGRAM Board training programs can provide valuable information on topics such as board readiness, networking, branding your skill sets, board governance, and reading a financial report. 3 ENHANCE YOUR PROFESSIONAL PROFILE People who conduct board searches often look at newspapers and magazines to see who is being quoted and written about. They’ll get to know you better if you offer yourself as a subject matter expert to editors in the business and trade press. 4 START SMALL Serving on the boards of non-profits, startups, industry, or trade associations will allow you to acquire valuable knowledge and become better known. 5 SEEK KNOWLEDGEABLE SUPPORT Organizations like Women Get On Board Inc. offer a wide range of training and support services, ranging from workshops to empower women to opportunities to increase your profile. Every year, in people in Canada experience a mental health problem. $50 billion per year to the Canadian economy in lost productivity and direct costs. As in many industries, healthcare has a predominantly female workforce and yet women aren’t necessarily reaching those top positions. There are a number of factors that lead to this discrepancy, including systemic barriers, receiving less advice from managers and senior leaders, unconscious bias—the list goes on. And of course, family and the fact that women are still often primary caregivers plays a role. “After starting a career, women sometimes have other priorities, and of course family has to come first, why wouldn’t it?” Bezzubetz asks. “There are hard choices that women still have to make in society that can at times throw a curve ball when it comes to being able to reach those top positions. But we are seeing more and more competent women leaders, and we’re trying to find ways to give women a hand up. And as a woman, having a different lens or perspective than a masculine counterpart, those are all assets.” The Royal specializes in caring for people dealing with mental health issues and substance use disorders. They have a care and research facility on Carling, as well as one in Brockville. In addition, they have a large team located in an office setting in the Carlingwood Shopping Centre. Offering care in a place where everyone goes anyway— like a shopping mall—helps clients feel less conspicuous and also gives them the opportunity to accomplish other daily activities while there, sometimes with support from The Royal’s team. Many of The Royal’s clients receive care without ever entering its facilities. The Royal offers outreach services, with staff visiting clients wherever they are—be that at their homes, long-term care facilities, shelters—when they are needed. Bezzubetz’s vision for the future of The Royal focuses on a hospital without walls. She plans to create more services that meet people where they are—like mobile clinics, outreach in schools, and virtual care. An example of this is telemedicine, which makes access to the hospital’s resources easier for their clients who can access services over the phone or video conference. This can greatly help caretakers and parents by reducing the burden and inconvenience of dealing with transportation and waiting rooms to get help for their families. The Royal’s telemedicine program is approaching a staggering 7,000 interventions per year. They are always working on developing new services to make sure that their care is available faster. “We often hear, particularly when it comes to substance use, if services aren’t available immediately, the window to help closes,” says Bezzubetz. “That’s not the clients’ fault. We should have been available. We want to turn that around, to make it more client-centred instead of provider-centered.” Bezzubetz is very community oriented, and believes in leading the way by example. “There are characteristics of my leadership that are because I am a woman,” she says. “I don’t try to hide those characteristics, which may be viewed as feminine, because that’s part of who I am. Things like compassion, caring, sensitivity—I want people to know that they don’t have to hide those characteristics, whether they are men or women.” This summer you can find Bezzubetz running in the 2019 SHOPPERS Love. You. Run For Women—alongside some of her female—and male—colleagues and clients. Stress in small doses can drive us forward but unrelenting stress can lead to burnout—a state of total physical, mental, and emotional exhaustion. Someone who is burnt out has lost the energy and drive to keep going, they feel like what they do is meaningless or a waste of time, and they become detached from things they were once passionate about. Burnout isn’t necessarily about how busy you are—overwhelming demands, unrealistic expectations, and boredom are all things that can lead to burnout. Left: Emma Bedlington, Manager, Stratos Inc. Right: Stephanie Meyer, President and Co-founder, Stratos Inc.
tion with Indigenous peoples as a cornerstone in building a stronger country for all Canadians. The Ottawa-based management consultancy, established in 2000, has a reputation for effectively assisting a wide variety of clients (including governments, businesses, and civil society organizations across Canada) to navigate complex sustainability problems and implement holistic solutions. “Our whole approach is to ask, ‘how can we do things differently to lead to better environmental and social outcomes?’” says Stephanie Meyer, the company’s president and co-founder. Stratos publicly launched its reconciliation strategy in June 2018, one of the first for a Canadian consulting company. “We made a very specific decision to share the document publicly and to include specific actions for implementation,” says Emma Bedlington, a manager with Stratos. “We think it is really important to lead by action—to ‘walk the talk’ so to speak.” Stratos’ strategy reflects the Truth and Reconciliation Commission of Canada’s Calls to Action and is built around three themes. One theme is to implement business and human resource practices that create opportunities for Indigenous people and businesses in Canada. operates several businesses and runs her own consultancy in Ottawa. Both were recognized for their achievements at the City of Ottawa’s seventh annual Immigrant Entrepreneur Awards. The awards recognize business leaders born outside of Canada who have harnessed their entrepreneurial skills to make a significant impact on the economy in the National Capital Region. Successful candidates show a commitment to hiring local talent, mentoring other entrepreneurs, and taking an active role in the local community. Oddly enough, given her success over the past two decades, Zhang recalls that when she started Wintranslation, she wasn’t sure she had what it takes to be a successful entrepreneur. “I was a new mother, I didn’t know much, if anything, about marketing or sales,” she explains. “Proper accounting was a mystery. I was basically a disorganized person. So even before I got started, I was tempted to give up.” But she didn’t give up. Instead, she drew on a lesson—a gift, she calls it now—passed down by her parents. “They taught me to never forget to look at the big picture,” she says. “There would be doubts, there would be setbacks, they told me, but by keeping my eye on the big picture, I could overcome anything.” And for immigrant entrepreneurs, women especially, there are always hurdles, be they financial, logistical, or even cultural. “It can be as simple as being expected to have a drink with your customers,” says Zhang. “Say ‘no’ in some cultures and you risk offending the customer or making them look bad, in spite of the fact you might not drink. Networking is a great way to promote your business but some customers may find your efforts invasive or unbecoming.” On the flip side, she says, cultural differences can be an advantage. That’s especially true for Wintranslation, which offers support services in 127 different languages. “Today, we employ a broad network of translators,” says Zhang, “many of whom are Canadian newcomers and Indigenous people. Approximately 90 per cent of our employees—and we now have a workforce of more than 100—are immigrants and 70 per cent are women.” Unlike Zhang, who had some early doubts about becoming an entrepreneur, Briones took to entrepreneurship, well, like a child takes to candy. “I was six years old when my dad loaned me the money to buy wholesale candy,” she recalls. “I went door-to-door, selling my candy at retail prices.” As her business prospered, Briones realized that she would have to expand if she wished to remain successful (she was running out of houses) so she moved her candy-selling operation to the school yard. That was fine until school officials noted a sizeable dip in business at the school cafeteria. That was the end of Briones’ candy-selling business. But it was the start of an entrepreneurial adventure that continues today. And while a change of direction is likely, the adventure is clearly picking up steam. moment, I can devote only one day a week to helping other entrepreneurs. But if I exit my brick and mortar businesses—and I want to— I’ll be able to offer assistance full-time.” “Immigrants are natural entrepreneurs,” she says, pointing out that most of the Mexican workforce own or operate small businesses. “When they arrive in Canada, their education, their training, and their ability to secure funds are all in doubt. I’d like to give them the tools they need to overcome those obstacles and to take advantage of the many entrepreneurial opportunities available in Canada.” In time, those immigrant entrepreneurs who persevere will create jobs, generate wealth and contribute—socially, culturally, and economically—to their adopted homes. Alje Kamminga is a former journalist and speechwriter who enjoys bridge, baseball and backgammon. A helping hand for women entrepreneurs Businesses started and run by women often encounter additional barriers in accessing capital. As a result, women entrepreneurs are less likely to seek debt and equity financing. Even if they do, they usually receive less money or are simply rejected. 16 % Getting started: Tips for immigrant women entrepreneurs If immigrant women entrepreneurs are to succeed, preparation, planning, and a positive attitude are essential. An expert on entrepreneurship offers eight tips to help immigrant women get off to the best start to their entrepreneurial adventure. 1 P  LANNING IS KEY You may not need a business plan, but you do need a planning process. 2 K  EEPING IT SMALL IS OK Try running your small business online, on weekends, and in your spare time to provide extra income. 3 B  ARTER IN MODERATION Exchanging professional services or bartering for needed materials can be a budget saver. In response to this situation, the Government of Canada recently announced the creation of the Women Entrepreneurship Fund to help female business owners of small- and medium-sized businesses grow their companies and increase access to international markets. Through the fund, women entrepreneurs in Canada will have access to $20 million in federal cash. Funds will be available on an application basis for the next two years. Each applicant will be able to request up to $100,000 in non-repayable contribution funding. 4 T  AP IN GOVERNMENT RESOURCES Government at every level provides free and easily accessible information and support. 5 N  ETWORKING IS NECESSARY Who you know is almost sure to be an important part of your successful small business journey.  CLEAR CUSTOMER PICTURE IS ESSENTIAL 6 A Your knowledge about the customer you want to serve determines where you’ll advertise and the content of your marketing. 7 B  E CULTURALLY AWARE Canadian culture is rich and complex, so cultural awareness is necessary.  EEK EXPERT HELP 8 S Accessing experts can save you a lot of heartaches and headaches. integration for many immigrants is challenging, it can be a particularly difficult journey for immigrant women. According to Immigration, Refugees and Citizenship Canada, immigrant women are much less likely to find employment than their male counterparts. And even those who do are almost certain to earn less than male immigrants. Ingrid Argyle, the managing director at Ottawa Employment Hub, and Hindia Mohamoud, director of the Ottawa Local Immigration Partnership (OLIP), are trying to create a better understanding of the problem and what can be done about it. Together, the two organizations are leveraging the expertise of academic researchers and partner organizations to create a nuanced understanding of the labour market experience of newcomers, with attention to the intersection of gender, race, and immigration status. “We know, for example, that immigrant women, the large majority of whom are racialized, face intersecting barriers to employment, such as access to childcare, discrimination, lack of recognition of experience and credentials acquired outside of Canada, and isolation from professional networks,” says Argyle. “This goes beyond commonly cited language barriers, and the result—as shown by the data—is a lower labour force participation rate and higher unemployment rate compared to both Canadian-born women and immigrant men.” “It is important to create targeted strategies that remove the specific barriers facing immigrant women, while at the same time addressing bias and discrimination in hiring and workplace receptivity. Creating these solutions will require new capacities and concerted collaborative planning by multiple stakeholders,” says Mohamoud. The good news is that many local organizations—employment service providers, business associations, immigrant and refugee settlement agencies, colleges and universities, municipal, health and social service and other organizations—partner with both Ottawa Employment Hub and the Ottawa Local Immigration Partnership. Together, these groups are identifying and generating opportunities for immigrant women, addressing barriers to immigrant women’s employment, and connecting immigrant talent with employment and entrepreneurship opportunities. Local employers can broaden their search for talent by reaching out to these organizations. A great place to start is Hire Immigrants Ottawa, an initiative to enhance employers’ ability to access the talents of skilled immigrants in the Ottawa area. STUDYING WHILE TRAVELLING ABROAD TEACHES HIGH SCHOOLERS LIFE LESSONS THAT CAN’T BE LEARNED IN A CLASSROOM. employers often recognize students who studied abroad as being more adaptable, independent, and well rounded. Learning to be Adaptable Travelling abroad while completing high school credits really brings learning to life and forgoes the traditional classroom dynamic. Imagine studying art history in the Louvre in Paris, functions on the Ponte Vecchio in Florence, or biology in Airlie Beach in Australia; the environment becomes the classroom and the cultures become the lesson. Students who study abroad develop the ability to adjust to different situations in new environments whether navigating the transit system in a new country, ordering lunch in a different language, or studying for exams while setting sail on the Adriatic Sea. Learning to be Culturally Sensitive Studying abroad is more than travelling. Students aren’t just visiting new countries; they’re living the life of locals as much as possible. Learning about the history, foods, customs, and values are all part of the immersion process. The ability to coexist with different people makes students culturally sensitive at a young age, which is so important in our globalized world. Learning A Global Mindset During some of our programs abroad, students get the opportunity to earn community service hours by volunteering in local communities in need. This March Break, students are heading to Peru and Costa Rica to work with animals and children, and take part in revitalization projects. The experiences are designed to open their eyes to other cultures and ways of life, as well as challenges faced in developing countries. Gaining great knowledge of the world expands their understanding and informs their perspectives on things like social issues and international conflicts. Learning to be Independent Travelling as a group of students, without parents, gives teenagers the confidence to adapt to situations and problem solve. Learning to rely on themselves for laundry, eating, and sleeping (with the supervision of school staff), gives students a chance to assert themselves, make mistakes, and learn invaluable lessons they will take with them to post secondary school and beyond. Leaving the high school bubble behind, and even travelling without friends, forces students to get outside of their comfort zone, try new things, and meet new people. Learning to Communicate While travelling through different cultures, students quickly become savvy at communicating with people who speak different languages. Getting to know gestures, respectable customs, and even learning new languages makes them comfortable communicating with others and making networking connections that may be beneficial down the road. Blyth Academy International Summer programs offer students grades 9 to 12 over 25 programs in over 30 countries. March Break Community Service programs travel to Central and South America for hands-on volunteer work and outdoor adventure. Our Global High School program travels the world for four terms to Europe, Asia, Australia, New Zealand, and Central and South America. We offer learning experiences in safe environments that go beyond any classroom education at home. Our goal is to help develop well-rounded young adults. Adding world experience to high school education can change the course of a student’s academics and inspire career aspirations. We encourage you to visit us at www.blythacademy.ca international for all of our study abroad opportunities. Richardson GMP, Canada’s leading independent wealth management firm. “We help business owners and professionals maximize how much money they have to do the things they love by using tax reduction strategies wrapped around investment advice,” Hall explains. With tax rates as high as they are, finding ways to correctly reduce the amount of taxes you pay will make a huge difference in your take-home amount. “Think of it like this,” explains Paula O’Brien, Director, Wealth Management. “A tax-dollar saved is one that you don’t have to take out of your investment portfolio to give to the Canada Revenue Agency: this will make the portfolio last longer.” The O’Brien Team was founded by O’Brien, who made a career change after working as a chartered professional accountant for many years. More recently, she met Hall at a networking event and they bonded over their past lives as accountants. Now they work together and use their advanced tax knowledge in addition to their expertise in finance to help their clients make the most of their money. As self-described “tax geeks,” the pair work well together to manage all aspects of their clients’ financial portfolios. “We know that cash flow doesn’t necessarily equal taxable income,” says Hall. “We help people plan for the cash flow they want while attracting the least amount of tax. We look at tax-reduction strategies over our clients’ entire investing horizon: from when they are growing their assets to when they are spending during retirement and, if they so desire, leaving some for the next generation.” Richardson GMP is the first wealth management company in Canada to be certified by the Centre for Fiduciary Excellence, which means the firm opens themselves to a rigorous, independent thirdparty audit of their practices. This esteemed annual certification program ensures that Richardson GMP’s Portfolio Management Account platform, for those advisors who have been delegated control over investment decisions for their clients, conforms to the global fiduciary standards of excellence. As a portfolio manager, O’Brien takes her role very seriously, ensuring she and her team act in the best interest of their clients. Their open architecture and innovative solutions mean they are not restricted in finding the types of investments that are best suited to their clients. This freedom allows them to create unique funds and fill marketplace gaps, and look for off-market opportunities when appropriate for their clients. When it comes to divulging your finances to someone, trust is key. “A client has to feel comfortable in everything that we do to allow them to share very intimate details of their lives—some of them personal, some of them financial—because really what we’re trying to be is a dream advocate for them to help them achieve their goals,” says O’Brien. “If there’s no trust, then we shouldn’t be their advisor.” They start the process off with new clients with what they call a “fit” meeting, to make sure there is a mutual feeling of comfort. The O’Brien Team builds relationships with their clients that extend through multiple generations. That’s why succession was on O’Brien’s mind when she took Hall into the fold. They now have a plan in place for Hall to assume leadership of the team in the next two years, but with an extended period of overlap to ensure a smooth experience for their clients. The client experience is always top of mind. As advisors, The O’Brien Team develops close relationships that allow them to witness the milestones in their clients’ lives. “We always love to get those calls when a client wants to take money out to buy a home for their family, or finally buy that boat they’ve talked about for years,” says O’Brien. “We are truly honoured to make a difference in our clients’ lives and witness the achievement of their goals.” Hall and O’Brien encourage investors to think about tax planning and investment planning being intertwined, not as isolated considerations only to be addressed at tax time. Their approach has a compounding impact on portfolios and can help you achieve your bucket list sooner! across the country (currently Toronto, Ottawa, and Calgary), as well as having the ability to place BriteSky Aurora PODDs on premises for their clients, BriteSky gives the customer unlimited flexibility and unsurpassed peace of mind. This allows customers to improve their business processes, competitiveness, or meet regulatory compliance. “As we’ve grown, we’ve continued to add capabilities,” says Harrison. “Decisive has been the engine behind it, but we’ve really been able to innovate with BriteSky offerings that have immediate results, giving customers the opportunity to meet real business objectives.” “We are able to customize our services to what our clients need,” explains Harrison. “We have a highly technical team that is able to give our clients the best of both worlds. Moving into a cloud experience really isn’t something you do on your own; we’re here to shepherd you on the way. We actually find that most customers don’t want to deal exclusively with the cloud, so we help them reach the outcomes they are looking for by combining our services.” On May 16th, BriteSky is holding a technology showcase at the Infiniti Centre. The event will feature their top partners, as well as many vendors and keynote seminars held throughout the day to learn about their technology and how it can help enterprise. first woman to ever hold the position of Chief Justice of Canada, and was the longest serving Chief Justice in Canadian history, serving between 2000 and 2017. A pioneer in the field of law, McLachlin found herself in the position of being a role model for young women across Canada. First called to the bar in 1969, McLachlin’s career coincided with major changes for women in the workplace. I had the opportunity to chat with her about her career and reflections on the ever changing landscape for women in leadership. Henny Buffinga: Did you first encounter a lot of resistance as a woman in the field of law? How did you deal with it? Beverley McLachlin: It was a very different day. I graduated from law in 1968, and in my class of law there were only five women. We would have been somewhere under ten per cent. That was considered a big advance, because a few years before there were virtually no women. It was a very male-dominated atmosphere. It wasn’t that people were hostile to women, but at the time there was an assumption that lawyers should, and would, be men. Occasionally one suffers from what we now call imposter’s syndrome. Many stereotypical notions still pervaded law firms and other legal institutions, so it was not as easy as it is now to make it as a woman in law. At the same time, it was a time when things were starting to change. And there were a number of wonderful people around, men, who could see that things should change. I was fortunate in my career that I had people like that who treated me completely equally and tried to do what they could to help me become a good lawyer and further my career. HB: You worked with a lot of impressive women, is there anyone you considered to be inspiring? BM: There were very few women when I started off, but as time went by I encountered some very impressive women and I learned and was encouraged by them. In British Columbia, there was a lawyer who was practically the only woman doing litigation in the seventies, her name is Mary Southam, and she later became a judge, and people like Justice Pat Proudfoot, and more and more as time went on. They were pioneers. I was lucky when I was appointed to the Supreme Court to have two women before me: Bertha Wilson, the first woman to be appointed to the Supreme Court, and Claire L’Heureux-Dubé, who is a very strong and wonderful person. HB: The course of your career coincided with a lot of change for women, could you feel that change as it was happening? BM: Oh, it was so obvious! In 1968, less than ten per cent of the class were women, and just a few years later, it was almost half. HB: Do you have any advice for women in male-dominated fields? BM: You have to persevere. You have to be resilient. You may occasionally encounter attitudes and barriers that you think are unfair, but you have to recognize that the world is changing; you can’t give up just because you face those barriers. It’s not right that you should have to face them, but you have to be resilient and move on. HB: What do you consider to be some of your greatest achievements as chief justice? BM: That’s so hard for me to say. People who come after me can make a better pronouncement on that. But I can tell you what I tried to do, which was to be the best judge that I could be, and help my colleagues as well as I could, and to make sure the court was working as a cohesive whole. I found that just the fact that I was there, as a woman, holding that office, was really important to mothers, fathers, and children. The idea that a woman could be the chief justice seemed to inspire people. I can’t take personal credit for that, but it was a remarkable thing—parents would bring their little girls up to introduce me and I would see their eyes shining. Children would send me projects from school. People throughout Canada were encouraged that women were taking a more prominent role in public affairs, and I, as Chief Justice, was a symbol of that. Even after 30 years, there is still more to discover. Getting to know our clients is something weâ&#x20AC;&#x2122;ve been doing for decades. Together, we can uncover the best solutions to maximize your marketing initiative. Sign up for a complimentary Discovery Session and get an expert analysis and recommended solutions summary tailored to the unique requirements of your specific project. We are a creative studio founded in 1987. Award-winning design and content have been our source of pride for 30 years. THE LABOUR AND EMPLOYMENT LAW EXPERTS Emond Harnden is trusted, not simply as advisors, but as an integrated member of our clients’ HR departments and senior management teams. We are devoted exclusively to advising management on labour relations and employment matters. It’s a forward-thinking approach to labour law. As a boutique labour and employment law firm, Emond Harnden has represented the interests of management in both official languages since 1987. Emond Harnden est un cabinet d'avocats en droit du travail et de l’emploi qui représente exclusivement les intérêts des employeurs, dans les deux langues officielles, depuis 1987.